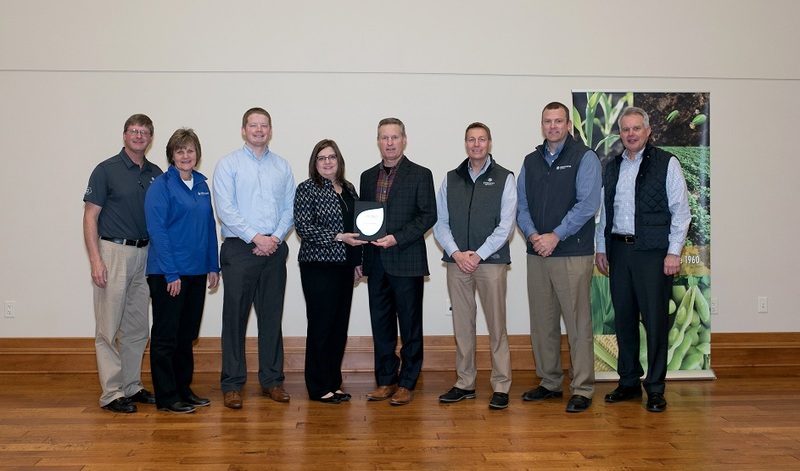 RAKE, IA (December 14, 2018) – Asmus Farm Supply Inc. (AFS) Rake, IA, joined the ranks of agriculture’s top environmental stewards when they received a state Environmental Respect Award for Iowa. To celebrate this honor with the community, Asmus Farm Supply hosted a Recognition and Celebration event on December 11th, 2018. Celebration Days is a program designed to bring community recognition to those fertilizer and ag-chemical retailers who took extra steps to operate their businesses in an environmentally sound manner. Attendants at the event had the opportunity to help honor those in agriculture who work to preserve and protect the environment every day. The Environmental Respect Awards are the agricultural industry’s highest recognition for environmental stewardship among U.S. agricultural retailers, those who serve farmers and ranchers with the nutrients, pest control and agronomic information critical to effective crop production. For 24 years, DuPont Crop Protection, CropLife® and Farm Chemicals International® magazines have sponsored the Environmental Respect Awards in a continuing effort to honor farm supply businesses that preserve and protect the environment in the course of their service to their farmer-customers. The program seeks to recognize good stewards, encourage stewardship among other ag businesses and disseminate information that provides managers with ideas on improving their operations. In the late 1950s, Harvey Asmus introduced a new way to farm. Chemical weed control was not a foreign concept, but it certainly wasn’t adopted by the masses. Regardless, Harvey believed in the future of farming and stood with his clients from planting through harvest and made a commitment to helping their operation succeed. Within the first decade of its existence, Asmus Farm Supply flourished in the new era of farming. Asmus Farm Supply was laid on the foundation of giving quality and sustainable recommendations for our growers to not only continue being stewards of the land, but stewards of our neighbors while helping growers optimize their yield and crop potential. AFS prides themselves in participating and educating others on sustainable practices such as cover crop, crop rotation, strip-tillage and the 4R + Program. Their company mission statement: “Consulting Clients with Sustainable Recommendations to Optimize Production,” where sustainability not only applies recommendations on soil sustainability and health, but also nutrient management recommendations that ultimately affect water quality. It also applies to good stewardship of tools we have in pest management areas. AFS works with sustainability issues outside of their local communities as well. Their Plant Nutrition (PN) Agronomists are both 4R nutrient management specialists through the CCA program. One PN Agronomist also serves on the advisory board of Iowa’s 4R+ initiative. In addition, their owner Amy Asmus, serves as the chairperson on the national level of the Agricultural Retailers Association sustainability task force where she works to provide guidelines and tools to retailers to implement their own sustainability programs.